Also known as the Kinneret, this is a fresh water lake in the northern Jordan Valley. The major source of its water is the Jordan River. 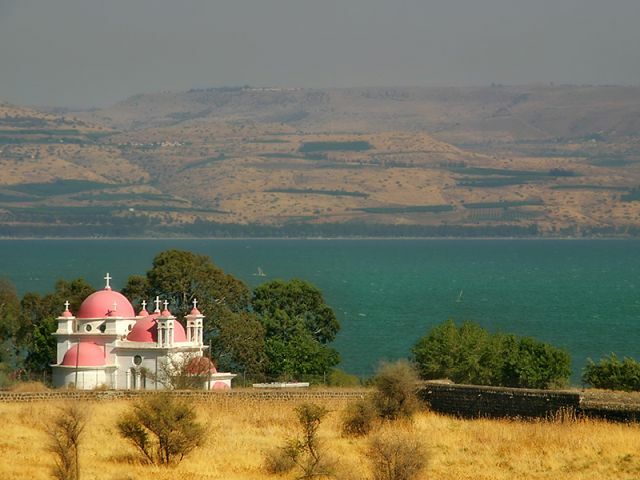 although the Kinneret is also fed by the Beit-Zaida Valley in the northeast and the Ginosar Valley in the northwest. It was around the Sea of Galilee that much of Jesus’ ministry took place, making it an extremely important pilgrimage site for Christians. Indeed, it was here that Jesus taught from his disciple Peter’s boat, calmed the raging storm, and walked on water. 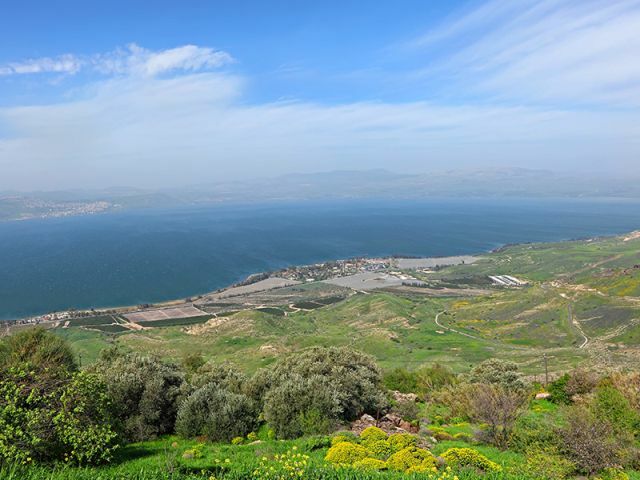 The Sea of Galilee is the world’s lowest fresh water body. Capernaum is surely one of the ‘must see’ sites on any Holy Land tour. In Christian tradition, this town is the birthplace of Peter, as well as the place where Jesus lived for some time. Indeed, here, he preached the Gospel and performed miracles. In Capernaum can also be found the remains of a synagogue dating back to the 3rd century. It is believed to have been built on top of a former synagogue where Jesus preached the Gospel and healed the sick. Capernaum is identified as the home of the apostles James and John, as well as Andrew and his brother Simon (“called Peter”). Peter’s house has been preserved, along with the remains of churches that were subsequently built in that spot; testimony to the length of tradition of pilgrimage to this site. This has been identified by archaeologists as the site from which the Sermon on the Mount was delivered. With a spectacular view of Capernaum, Tabgha, and the Sea of Galilee, this hollow-shaped hill serves as a natural amphitheater, leading some to believe that Jesus would have stood at the bottom of the hill when he delivered the Sermon. 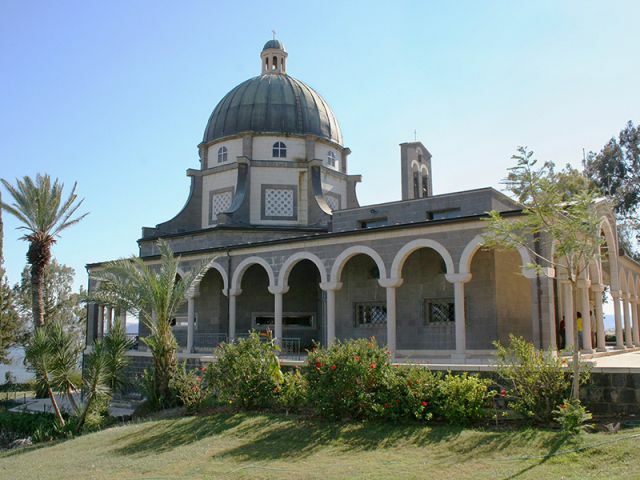 The Mount of Beatitudes has a beautiful flower garden and a magnificent church on its crest which was built by the Italian government in the year 1937 and has always been a treat for visitors. Nazareth is the largest city in the Northern District of Israel. Considered a Holy City by Christians, it is the place where Jesus spent his childhood and youth. In Hebrew it is known as Natsrat, which indicates that Jesus was a Nazarene and therefore his followers were Nazarenes, (Notsrim in Hebrew). Located in the Galilee region, this city is first mentioned as a Jewish city in the New Testament about 2000 years ago. In fact, it remained so even after the destruction of the Second Temple in 70ce. After the Byzantine victory over the Persians in 614ce, Jewish Nazareth was destroyed. The City of Nazareth then became a stronghold of Christianity. Throughout the Byzantine period, it was the cradle of Christianity, and even until today maintains his reputation for spirituality, holiness and faith. Its wealth of history is intriguing. 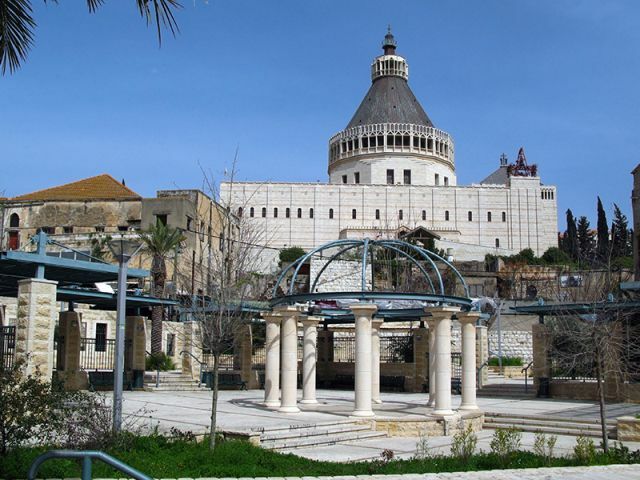 Nazareth’s first church – the Church of the Annunciation – was built at the traditional site of Joseph and Mary’s home. It is believed by Christians to be the place where the Angel Gabriel appeared before Mary, and told her that she would bear a son. The significance of this Church of the Annunciation cannot be underestimated and has, of course, paved the way for the establishment of other Churches. Next to it is the Church of Saint Joseph where, according to Christian history, Joseph had his carpentry shop. Today, the city is surrounded by approximately 30 other churches, in addition to mosques and ancient synagogues. Whilst in Nazareth a visit to the Old City Market is highly recommended. 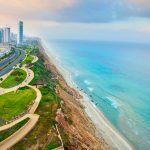 Renowned for its wide variety of fabrics, local foods, spices, wooden carvings, and other souvenirs, it offers visitors offer an authentic Middle Eastern experience. 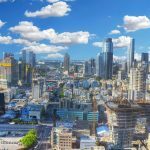 Located on the western shore of the Sea of Galilee, and named after the Roman Emperor Tiberius, this city offers a beautiful views of the area and also many opportunities to rest and relax. With a promenade along which one can take in the scenery, and light shows at night, it is often a starting point for any tour of the Galilee. 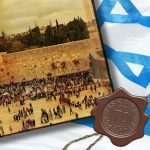 The Old City and its surrounding areas are of great importance to both Jews and Christians. Indeed, Tiberius is one of the holiest Jewish cities in Israel and, for centuries, was the focal meeting point for Talmudic scholars. This old town is full of various pilgrimage sites and churches, not to mention well-preserved ruins and buildings from many differenteras. Tiberius also boasts local hot springs, and many burial sites of rabbis and Jewish scholars. There are numerous buildings of archeological interest – Tel Rakat, Ein Kotzer, Roman and Crusader buildings and towers, and even an ancient Roman bathhouse. 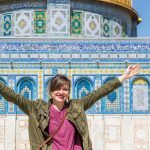 When on a Holy Land tour, after having viewed the many historical and biblical sites, visitors would do well to enjoy themselves in the city’s lively commercial/downtown area. Tiberius contains many excellent restaurants, and after having eaten well, tourists can even take a tour around the town in a horse-drawn carriage. The site of Yardenit is located on the Jordan River, at the south of Lake Galilee. Jesus was baptized here by John the Baptist. and then Jesus practiced and preached across this part of the Holy Land. Yardenit is a a beautiful place, surrounded by eucalyptus trees and spectacular flora and fauna, it serves as a baptism site for thousands of pilgrims who flock here year round. These pastoral landscapes are a wonderful place for contemplation – otters even swim freely in the river! Also known as the Basilica of the Annunciation, this church in Nazareth recalls the visit of Angel Gabriel to the Virgin Mary, announcing the conception of Jesus. This church is the most inspiring and impressive site in the city of Nazareth and also one of the most important churches in Israel. The enormous and striking two-storey basilica was built over the remains of Byzantine and Crusader churches. Designed and decorated in a contemporary style, this church became the largest Christian church in the Middle East after completion in 1969. The Sea of Galilee is situated in north-east Israel, between the Golan Heights and the Galilee region. It is close to Jordan Rift Valley, which came into being when the African and Arabian plates separated, long ago. As a result, the area is subject to minor earthquakes. Previous volcanic activity is also in evidence - the abundance of basalt and other igneous rocks that show the geology of the area.